The associate and coordinator of Rahman’s Chambers is an important post allocated to a member of legal consultancy and documentation team. It is a fast track position with higher duties and responsibilities. As a senior member of the legal consultancy and documentation team the person under supervision of Head of Chambers and in consultation of other members of the team carries out important legal consultancy related work and also few complex drafting works. As when required, he or she also fills the casual vacancy of other team. Many of the affairs of branch offices in Gulshan, Kakrail and Chittagong are coordinated through a coordinator, working from Banani main branch. Besides, coordinator plays an important role by maintaining liaison with client and concerned lawyer to avoid delay and communication gap. The coordinator is also responsible for corresponding with prospective clients in consultation with head of chambers. In the capacity of a coordinator the person in charge is next to the Head of Chambers which regard to entire management of Rahman’s Chambers. He also fills casual vacancy of senior management staff in suitable cases and deals with few delicate management issues if so required. Received Best Team of the Year Award as a member of Consultancy and Documentation team in 2018. 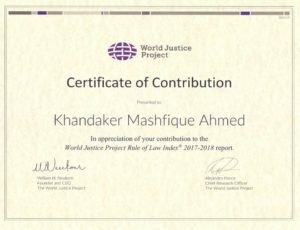 Mr. Khandaker Mashfique Ahmed was awarded a Certificate of Contribution to the ‘World Justice Project Rule of Law Index 2017-2018 report. Mr Khandaker Mashfique Ahmed successfully completed his Diploma in Law and LL. B (Hons) from University of London. He has also completed his Master of Laws (LL.M) on International Business & Commercial Law from Isles International University, UK. Before joining the firm, Mr. Ahmed worked with two major corporate law firms. He has developed expertise in the areas of Commercial, Admiralty, Construction, Corporate matters. He already displayed his ability and skills of a coordinator and associate. Drafted plaint/application in admiralty suit filed for MV Magnum Force against Bangladesh Navy. Drafted plaint/application in admiralty suit filed for MV Mim Supramax Vivi against MV Asad-2, MV Halicapnassus V & MV Amazonit. Drafted Plaint in admiralty suit filed by Integrate Fuels Inc. against Port Fuel supplies Co. relating to supply to MV Ocean Glory. Drafted joint venture agreement for VKC Group. Drafted Vendor Agreement for Maruhisa Pacific Co. Ltd. Drafted Tripartite Agreement for NRB Equity Management Ltd.
2017 Masters of Law (LL.M), Isles International University, UK. 2013 PGDL, City Law School, City University, UK. 2011 Bachelor of Laws (LL. B), University of London. 2008 Diploma in Law, University of London. Achieved Best Performer Certificate -March 2017. Achieved Best team Performer Certificate -August 2017.